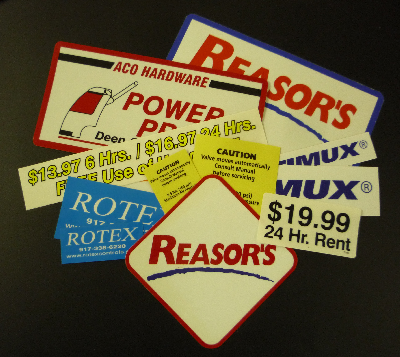 Lexan (polycarbonate) rear-printed decals with 3M adhesive are best for touch pad and highest quality applications. The highest quality decals are those made of Lexan (polycarbonate) with the image printed on the backside and then laminated with 3M adhesive. These are the best for Touch Pad applications and product identification that can not be scratched or easily removed. Anytime Sign screen prints Lexan (polycarbonate) and Mylar (polyester) with solvent screen print process (the highest quality process) and uses 3M adhesives for the absolute best adhesion to any surface. 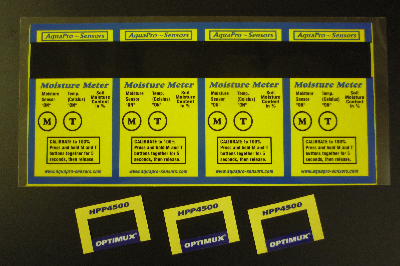 We use 3M 467 MP, 468 MP and 300 LSE adhesives. 300 LSE is best for low surface energy plastics. Lexan (polycarbonate) comes with a matt surface to prevent glare and fingerprints. Anytime Sign also makes less expensive rear-printed decals (shown above and below) with clear Mylar (polyester). Lexan (polycarbonate) decals are best for touch pad applications (top decals) and odd shaped die-cut decals (bottom decals). Call Patrick at 1-800-582-1554 to discuss your Lexan (polycarbonate) and Mylar (polyester) decal needs.